The James River House is located in the rural town of Scottsville, Virginia, on a hilltop overlooking a river. 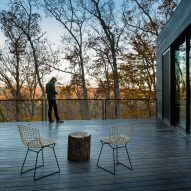 Situated on a 44-acre (18-hectare) forested property, the retreat serves as "place for three young boys to grow and learn from their surroundings", said Architecturefirm, a studio in Richmond, Virginia, that was established in 2009. Encompassing 2,750 square feet (255 square metres), the home consists of three rectilinear volumes, each serving its own function. The central volume contains public zones, while the wings contain sleeping quarters. 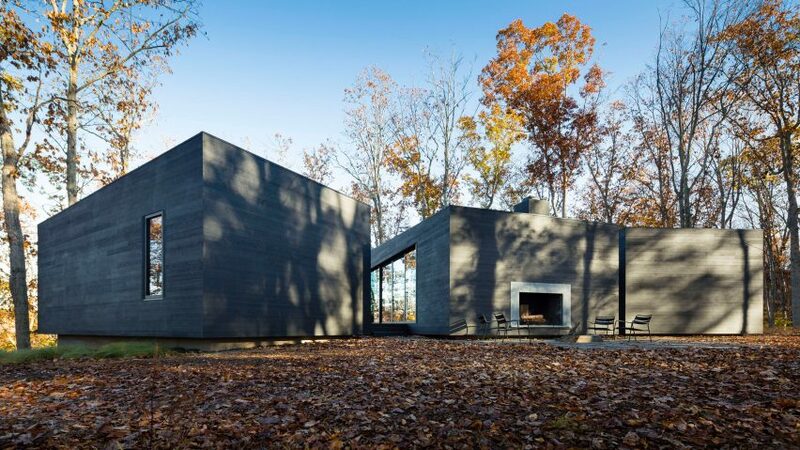 "The three volumes of the house hover above a bluff alongside a bend in the James River, arranged loosely and lightly on the land like a scattered group of stones around a campfire," the firm said. "The arrangement of these volumes allows the visitor to slip between and through the house, opening the view to reveal light, river and the woods." The house is accessed via a nearly half-mile long road that passes through the wooded site. Visitors arrive at a garage building, where they park their cars and walk to the cabin – evoking the feeling of hiking through the trees and leaving the city life behind. They then encounter a terrace made of stone pavers and an outdoor fireplace built into the south-facing facade. The team used two different facade strategies. The north side, which looks toward the water, features large windows that provide sweeping views. The volumes were angled away from each other so that residents are afforded several different vistas. The southern facade is more opaque and angles inward, "reinforcing the sheltered atmosphere of the south elevation and the outdoor hearth". Given its minimal glazing, this side also helps keep the cabin cool during the summer. Inside, the central volume contains an open-plan kitchen and living room that is designed to be both intimate and expansive. 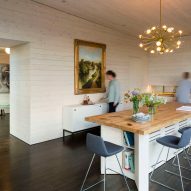 "This central living area is at once hearth, tree house and dining hall – and is the nexus of activity for the family and the three boys who fill the house with light and motion," the studio said. A glass-walled walkway connects the main volume to a sleeping wing, which houses the master suite and a children's bedroom with eight built-in beds. The other volume, which is detached, is dedicated to guests. An adjoining deck provides a place for occupants to "enjoy good weather and take in the cycles of the seasons, tucked into the canopy of surrounding trees". One of the most important goals of the project was having minimal impact on the terrain. 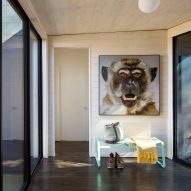 By elevating portions of the structure, the team was able to reduce the home's footprint. "There was no grading done to any part of the site, except for the gravel path to drive in to the project – all done to minimise disturbance and honour the existing landscape," the architects said. Other dwellings in Virginia include a house by architect Robert Gurney with a geometric roof, which folds over the building to protect it from harsh winds, and a residence by Höweler + Yoon Architecture that consists of stacked blocks arranged in a bridge-like formation.